Here are some things to know, before you decide to use VPN. Those things I wrote based on my own experience after using VPN for a month. I used ProtonVPN, but those things I mentioned below can be applied to any VPN provider you used. This will happen for the first time when you used a VPN. Some major sites like Google, Facebook, Twitter, or PayPal will ask you to verify your identity through some ways like asking your phone number or asking you to input the codes they sent to your phone. This is their security precaution, which is good. But this will add even more hurdles when you accessed your account through several devices like your laptop, phone, and tablet -- which is very common scenario these days. If you don't purchase the plan that allowed you to connect all of your devices to the same VPN server, those major sites will keep asking yout to verify your identity everytime you tried to access your account. Using VPN will make your public IP address changes. This means, if you're accessing an online service that only allowed white listed IP address, you'll need to add your new IP address after connecting to your VPN server's provider. I tried it myself. I connect my phone to the ProtonVPN, and activate its WiFi tethering. Then, I connect another device (tablet and a Mac) to that phone's WiFi. I expect my tablet and Mac will get online through ProtonVPN. However, it's not the case. I am not sure with other VPN services but it seems normal for VPN providers to block such scenario. Let's say you have account and data on a Site "A". One day, that site's server is breached and your credentials for your account there, was leaked all over the internet. Even though you always connect to Site "A" using VPN, your account's data saved on Site "A" server won't be protected by your VPN provider. It's just beyond its capability. Yes. Your ISP or any other third party will find it harder to breach or listen the data you sent through VPN. But again, once your data reached and saved on the other side (server), your VPN can't protect them anymore. Choose provider which had "no log" commitment. I used ProtonVPN and they said they had "no log" commitment. Just be sure you always use the VPN with such commitment. This means, they won't save your online activity log like which sites you accessed, or what ISP provider, or what's your real IP address, on their VPN server. Don't ever think or try to use VPN to do anything shady. Never, ever use VPN to do something shady. Period. See the screenshot of my ProtonVP application on my Mac OS Mojave below. 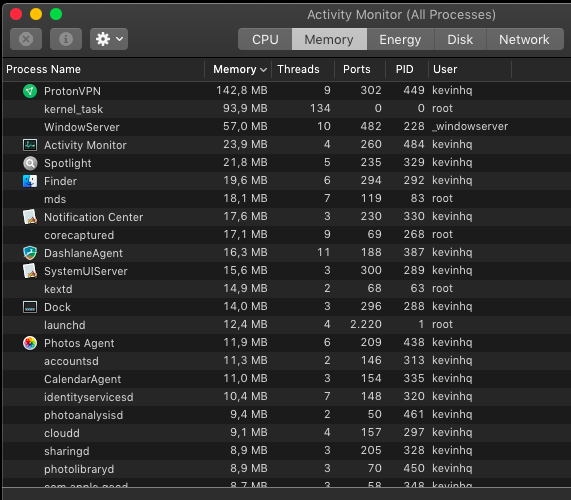 As you can see on the screenshot on the left (click it to see the larger image ), the ProtonVPN memory usage is about 142.6MB. In my case, it's an app that's using most of memory (RAM). I am not saying this is bad but you may need to think again about using VPN if you don't have sufficient memory left. The screenshot is taken when I had not run Chrome or Safari. I usually run both of them when I am working with my Mac. Even with those two browsers running simultaneously, the ProtonVPN app is still at the top 10 of the list. For me, since most of my activities on my Mac is done through web browsers, it did not bother me at all. But if you had another app running that also needs big memory usage, you may need to calculate again before using the VPN. If your purpose is only bypassing the blocked site, a web proxy might be sufficient for you, instead of VPN. Why? Because the VPN provider you connect, will see your details, your real IP, your ISP. Even if those logs will be deleted later. Not to mention that your ISP will know that you connect to a VPN, though they never know which sites or services you're using through the VPN server. So if you want to be truly anonymous, you need more than just a VPN. But VPN is still giving you better protection and better privacy rather than going online without it. It is not free though it's not that expensive. If your activities are heavier such playing heavy online game (like MMORPG) or watching film (like Netflix), or streaming, then you'll be disappointed to use their free tier plan. It's because VPN is just like your ISP. They can see your online activity, your IP address, your ISP, etc, etc. They know your details though they won't save those informations ( logs ) on their server. Always be cautious when choosing a VPN. Read some reviews, even better if the provider can give you a free trial or money back guarantee so you can have your money back when you're not satisfied with their service. It will be meaningless to use VPN when your favorite sites, blogs, online services, API, or anything you're using online is blocking traffic from VPN. This is why, choosing a provider with free trial option or money back guarantee is truly important. The VPN service might be great. It might be fast. But if it's blocked to access the services you're used to access, then it's just adding more hurdles.